The company Dogneton began manufacturing and selling footwear in the Perigord Vert in 1947. In 1984, the business name was changed to SODOPAC (Société Dogneton Pantoufle et Article Chaussant). Since its creation, and through its various managers, the company has always been characterised by its constant drive to innovate. And thus the twin-layer Charentais slippers were created, consisting of a traditional Charentais upper on a sole equipped with a wear layer. Subsequently, a unique process for the production of expanded polyurethane foam soles was developed, resulting in a new patent, and today, thanks to these materials, we are able to offer truly unparalleled comfort under the AIRPLUM brand name. 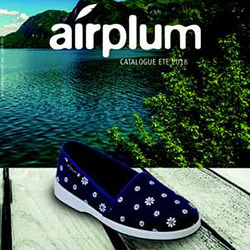 The quality and appeal of the AIRPLUM products have enabled the company to develop, to the point where today we have a team of 40 employees, boasting a wealth of skills and know-how, in a 4,000 m² factory located in AUGIGNAC, in the heart of the Perigord Vert. SODOPAC has successfully earned the trust and confidence of the major distributors thanks to the quality of their products, their responsiveness and the reliability of their industrial processes. SODOPAC also presents seasonal collections through their network of over 300 loyal retailers, who appreciate the uniqueness and high quality of their products. Business15th July, 2017THE NEW SUMMER 2018 CATALOGUE is online, so get ordering!